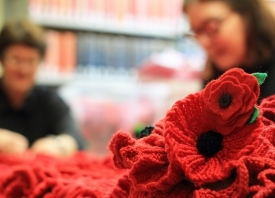 The National Army Museum is making a patriotic ‘call to yarn’. With the assistance from the general public of New Zealand we are aiming to produce one hand crafted poppy for each person lost by our nation in the Great War. That is 18,166 poppies! These very special tributes will be on show at the National Army Museum in the form of a cascading waterfall of poppies in the Museum’s memorial area. If you are a little bit crafty you may like to help with this special project. 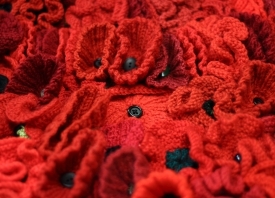 Poppies can be hand crafted in anyway (knitted, crocheted, sewn, soft crafted), but must be a red Flanders style poppy. There are several patterns available to assist you in your contribution. Please see patterns above. To achieve, one hand crafted poppy for EVERY New Zealand Serviceman or Woman lost during War or conflict. (Army, Navy, Airforce and Merchant Navy). 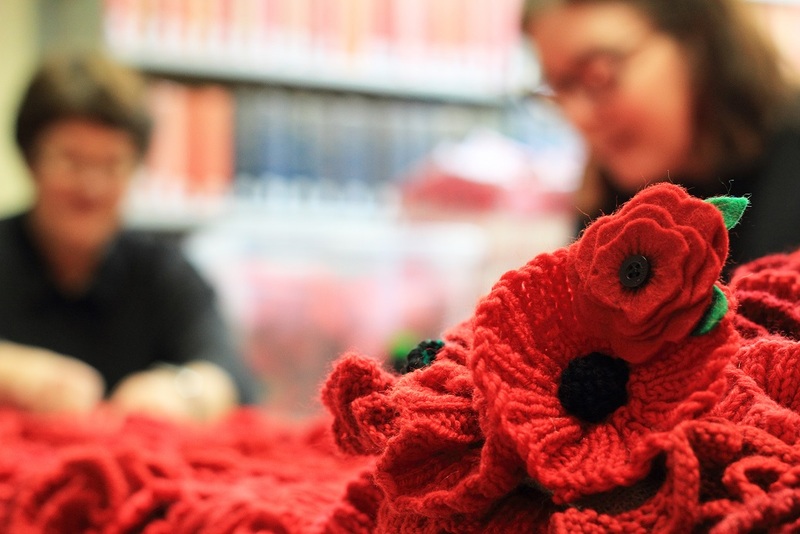 We have already achieved 18,166 – so that is a further 12,309 poppies. These poppies must be smaller – no more than 7cm in diameter* – so that they can be remembered together in one memorial piece. *Please note: All poppies will be accepted so do send poppies already constructed larger than 7cm. Smaller poppies are encouraged for the new format to ensure they are able to be displayed altogether. 21 year old Rifleman, Chudleigh Inwood Kirton was one of ten soldiers killed during WWI in a terrible tragedy at Bere Ferrers station near Plymouth in South Devon. Chudleigh was Shelley Kirton of Northland’s great uncle and she has made a very special tribute through the National Army Museum’s Patriotic Call to Yarn project, of ten immaculately hand-made poppies to represent each of those men killed. 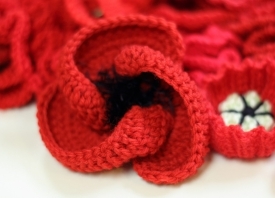 Shelley said “I am very proud to have participated in this wonderful memorial exhibition and it has been quite an emotional experience to knit a poppy for each of these lost soldiers”. 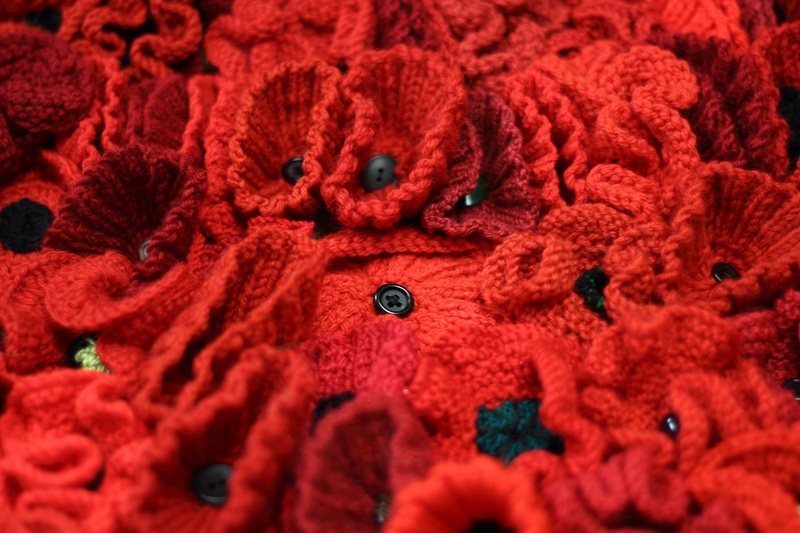 These ten beautifully knitted poppies will be placed together in honour as a mini memorial within the project to remember these ten men who were so tragically lost. Facebook Announcement: Thank you New Zealand, but it is now time to lay down your needles. Facebook Announcement: WE HAVE REACHED OUR TARGET OF 18,166 POPPIES! I am delighted to announce that the Museum has reached its target for the original Patriotic call to Yarn project. Such is the support that the Museum has, the project will continue in a different format – A Patriotic call to Yarn – The Last Post . To achieve, one hand crafted poppy for EVERY New Zealand serviceman or woman lost during War or conflict. Based on the Museum’s Tears on Greenstone database, that is 30, 475 names from all services (Army, Navy, Airforce and Merchant Navy). We already have over 20,000 poppies. The new project must have a smaller poppy – no more than 7cm in diameter, so that they can be remembered together in one memorial piece. Our website is being updated with further information and some different patterns for you to try. Latest update – we are now up to 13,300 poppies!! We have been inundated with parcels over the summer holiday period much to our delight as we had thought things might have slowed down in the hot weather knitting wise. We continue to be taken aback by the support from all over New Zealand. Special mention must go to NZ Post for their sponsorship support, and to both Knitting World and Quilting Focus for the mention on their websites. We have been honoured to be mentioned is so many different newspapers all over the country. Poppy Coordinator Alison Jones said, “We have been overwhelmed by the response and interest in the project so far and are fast approaching almost 4,000 poppies. We appreciate all the support of so many people from all around New Zealand as well as those of the knitting world including Jayne’s Wool Shop in Whakatane, The Woolshed in Taupo, Countrywide Yarns, Knitworld and Knitknuts Knitting Club. Special mention must also go to Westlorne Ltd for their help in supplying the materials to sew the poppies onto. On 11th November as part of the Museum’s Armistice Day service the first of many panels of cascading poppies was unveiled in the Roimata Pounamu Tears on Greenstone memorial. We will keep you posted, in the meantime keep sewing and knitting.